The girls have been busy creating and wow the response is amazing. If you are interested in a class please do not hesitate to contact the shop and book as spaces are limited and booking out very fast. Easter - we are open Easter Saturday, but decided to let the girls have a break over Easter. Dawn and I will be running the shop. As you can see we are really trying to look ahead, and the girls are playing and creating some great samples. Karen and Niamh have some other samples instore for consideration for future classes, so make sure you check them out and tell us if you maybe interested in attending a class. Please Note: As many of these classes are class only, it is appreciated if you pay for your class as you book. The girls are contracting the majority of the classes this year so require payment to confirm your seat. If you happen to cancel there will not be a refund if your seat cannot be filled. You may get a kit, but it possibly won' have full written instructions. We are trying to look ahead, and give plenty of notice so payment can be finalised at least 3 weeks prior to the class, this then gives the teacher time to prepare the necessary kits. Your cooperation in this matter would be appreciated, it is the norm in all stores on the mainland and we have found it necessary to adopt the same. 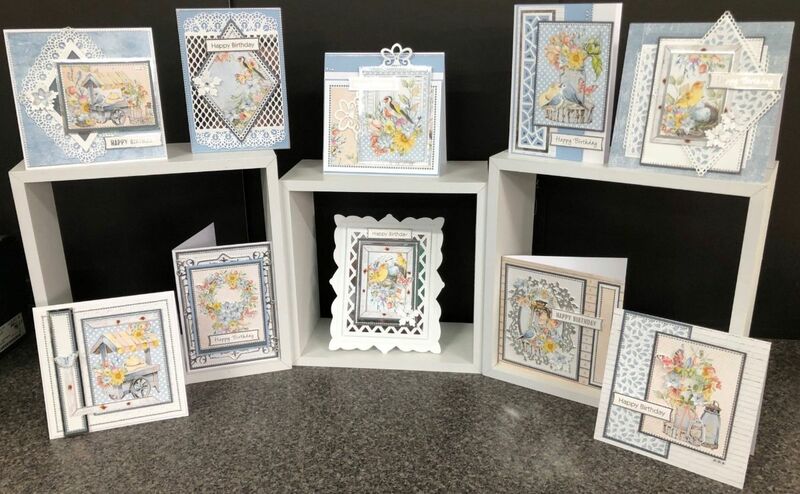 These cards were made by Lisa using Mintay Bloomville paper collection and the class was held recently. Unfortunately I wasn't able to share prior to class. Kits are still available, for $50 you receive everything to complete the 10 cards, including all the diecuts precut, and the majority of the cardstock cut to size. All you will need to complete the kit is your adhesives and a good pair of fine scissors. Lisa used the Diamond Die Release that was recently released from Heartfelt Creations, they are a stunning set of dies, and compliment the Bloomville Collection so well. We all know purple is a very popular colour. When ever we do anything in purple, it is extremely popular, so if you are interested in this class or kit contact us at the shop 64273972 or email and organise ASAP. The kit will be available as soon as the class has been held. Provence was a recent release by Stamperia, and Lisa has created some amazing cards. There are 10 cards in the kit, with all diecuts precut, paper and cardstock layers precut and all embellishments supplied. All you need to complete the cards are your own adhesives and a small pair of scissors for fine fussy cutting. 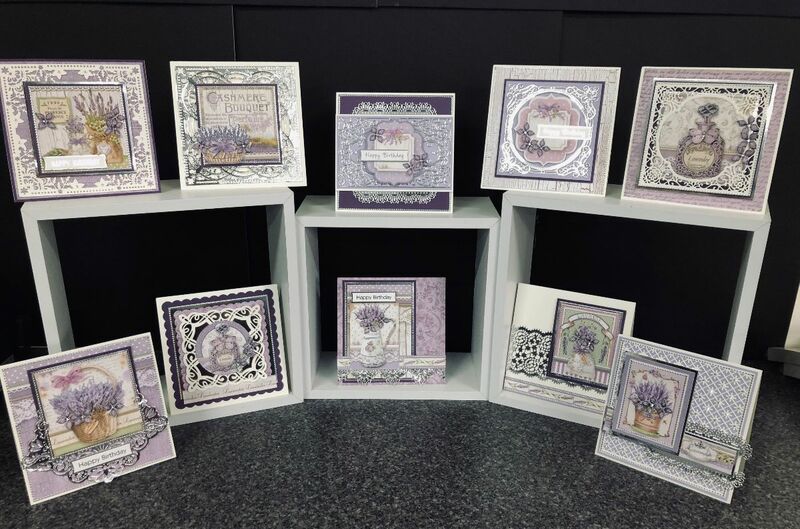 Karen has created these 6 delightful cards using a recent release from Mintay. They can be used as Baby Cards, A Childs Birthday or Easter....they are so versatile. These are slightly different to our normal card classes as there isn't really any dies used. 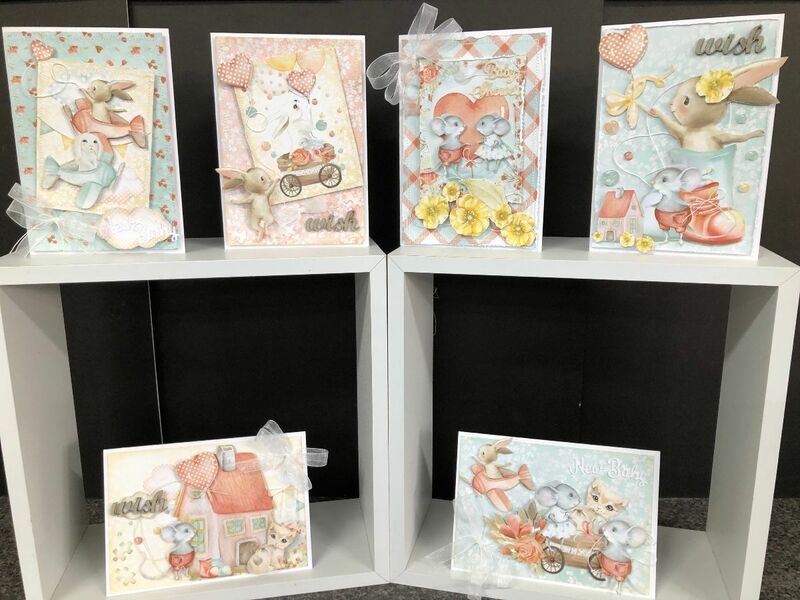 Karen has been extremely creative using the images and background papers to make beautiful soft cards. There is fussy cutting so a good pair of fine scissors are highly recommended. Karen will be bringing her sewing machine along as she has used that to decorate a few of the cards, (this will be optional in the class). This is a very hands on class and Karen certainly hopes to teach you some tricks and techniques. BOOKINGS FOR THIS CLASS DO CLOSE ON MONDAY 1ST APRIL AT CLOSE OF BUSINESS, IN ORDER FOR KAREN TO PREPARE THE KITS. 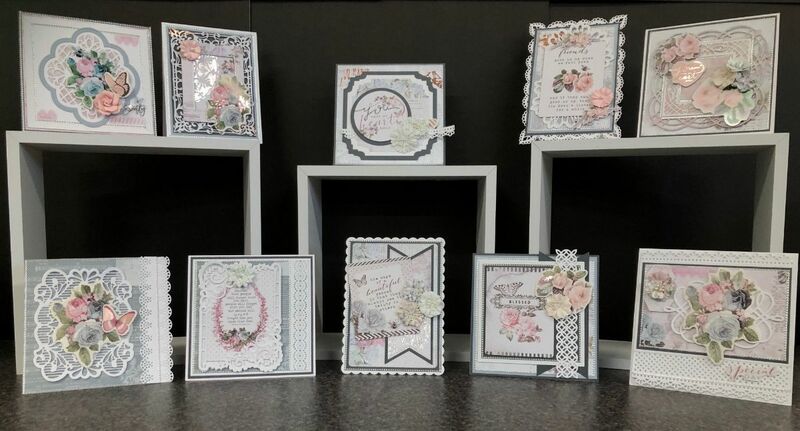 Lisa has created these cards using a recent release from Prima, also using a selection of embellishments from the Poetic Rose range. Lisa used ephemera, pack of coordinating flowers, and 3x4 journalling cards, including creative expressions luna paste with the stencil included in the pack of flowers. Certainly lots of extra's used in this class, so hence the slight increase in price. Kit also available for this class. 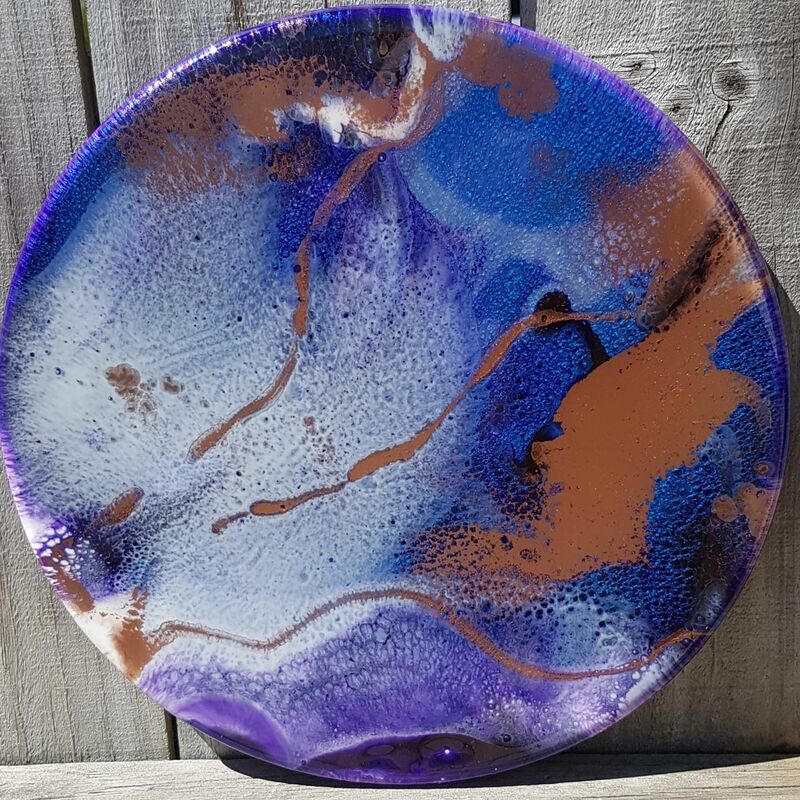 If you have ever wanted to try your hand with Art Resin, now is your chance!! In this class you will learn the basics of resin pouring. You will complete a 40cm round board and have a choice of a great range of colours and mediums to choose from. Class numbers are limited to 4 people to ensure Dawn can provide everyone the necessary attention. The class will take approximately 2 to 3 hours. To secure your space, please call the shop on 64273972. All materials are included in the cost of the class. Come and have fun pouring Resin, it’s sticky and colourful and it is very addictive. (PLEASE NOTE: your completed board will be available for collection from the shop 24 hours after your class - the resin needs time to set prior to being moved). Lisa created the first album/book as a gift, when she brought it in the store to show, I couldn't not get her to teach the idea, so Lisa completed the second album/book and I shared on Facebook on Saturday night, and WOW the response was amazing. The class booked out in less than 24 hours........so if you missed out and you would like to attend a class, please contact the shop and we will see if there is enough interest and when we can organise another class. Lisa has used the Heartfelt Creations Fold Out pages to create two very elegant flip albums/books. 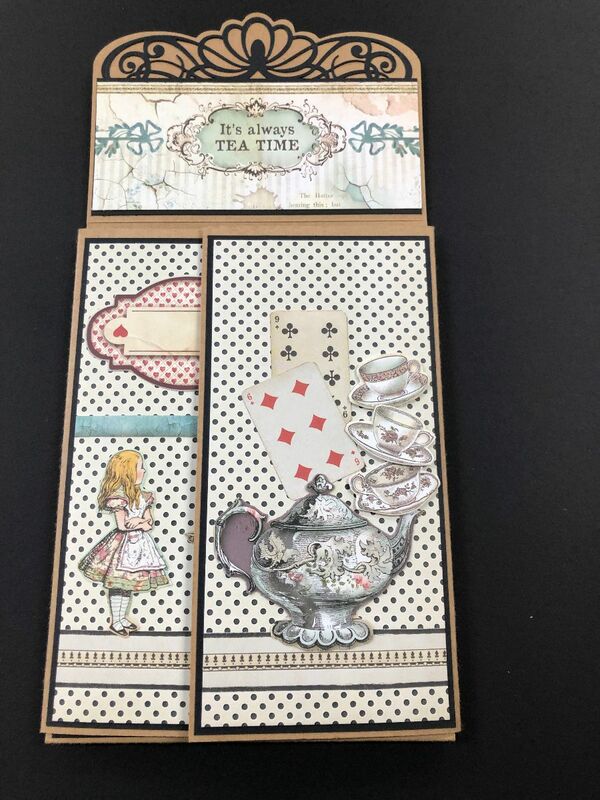 You will receive the complete 12x12 Stamperia Alice collection, so when you go home if you wish to add further embellishments you will have plenty of bits and pieces to choose from. Lisa has left spaces so you can add your photos and personalise when you get home. If you click on the links below you will be able to watch a video of how the books look inside.....They are simply stunning, so elegant. 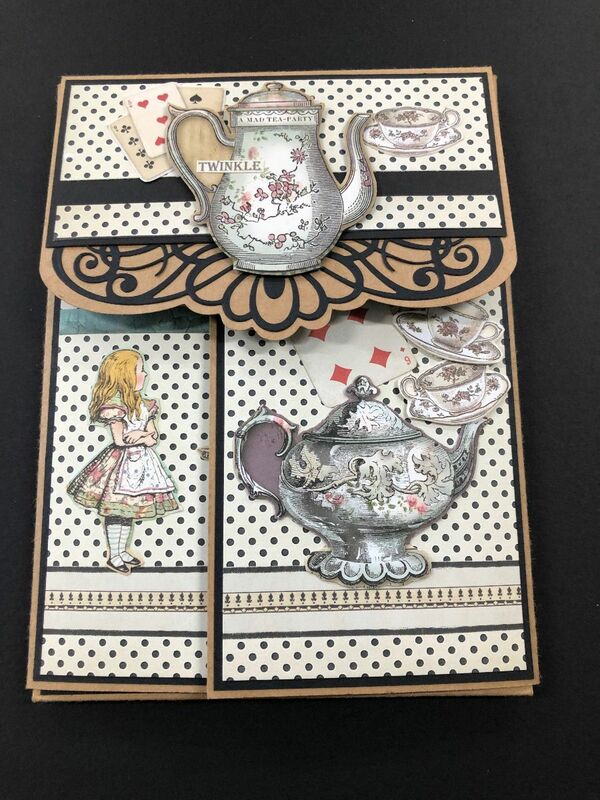 Julie has been a card designer for many years and wants to share her tips and techniques in how she looks at paper and starts creating.....in this class you will create 2-4 cards, the first being the Becca Feekan style concertina card, then from there it depends on where you would like to take it for the remainder of the class. Learning from Julie how she chooses her papers, how to decides what to put where. You are required to prepurchase the Mintay paper and coordinating cardstock prior to the class in order for Julie to precut the concertina card. Class registrations need to be completed prior to 26th April in order for Julie to prepare for the class. 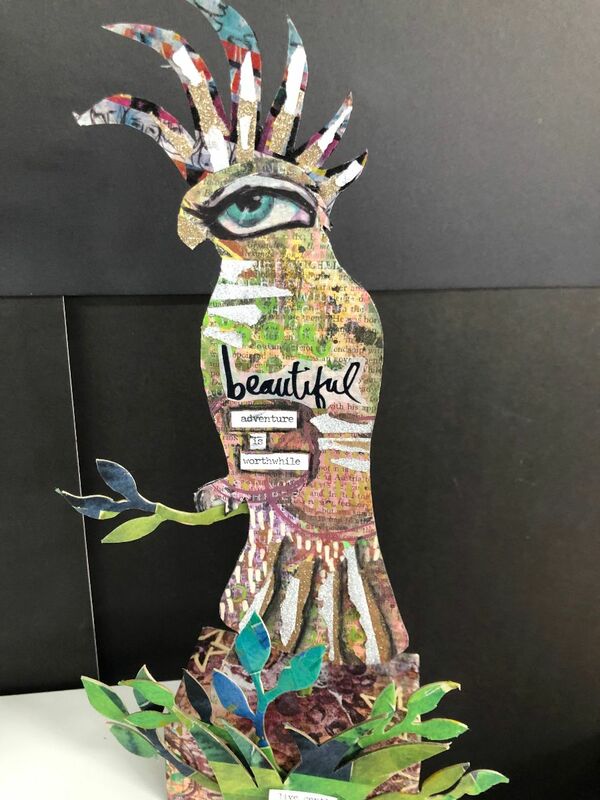 Create your own freestanding art doll combining many different collage and mixed media techniques on one unique piece of art to inspire your creativity. 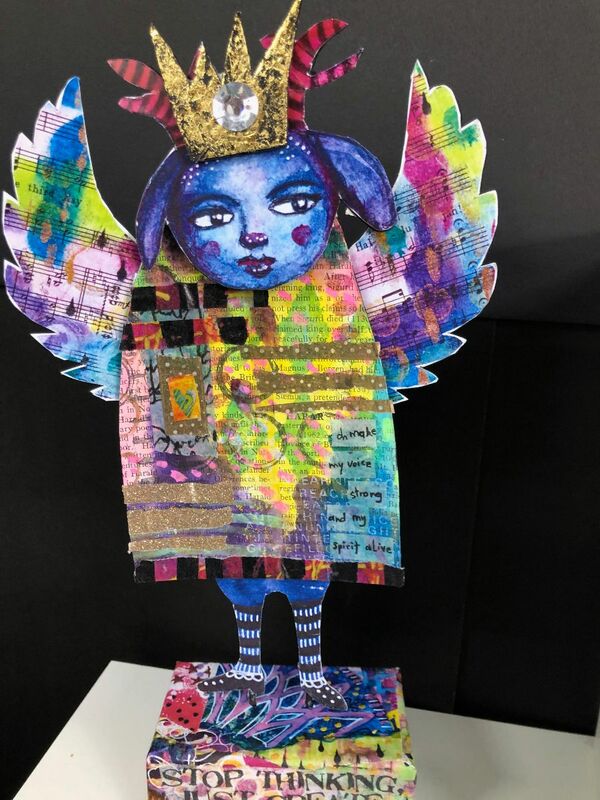 The project teaches the basics of layering different media, collage and mark making as well as constructing a quirky doll in the process. This course is about learning techniques and how different media can work together to create interesting textures and effects. Please be aware mixed media is always going to create unique and original pieces of artwork which can not be replicated exactly. The techniques in this project can also be adapted to work in a journal or using different body patterns. Ensure you check out Niamh's other creations instore as she is certainly very adventurous when it come to colour and design. Registrations need to be finalised for these two classes by Tuesday 23rd April. We have had many questions on how to use alcohol inks, so Karen has created this class to show various ways alcohol inks can be used very simply to create great projects. 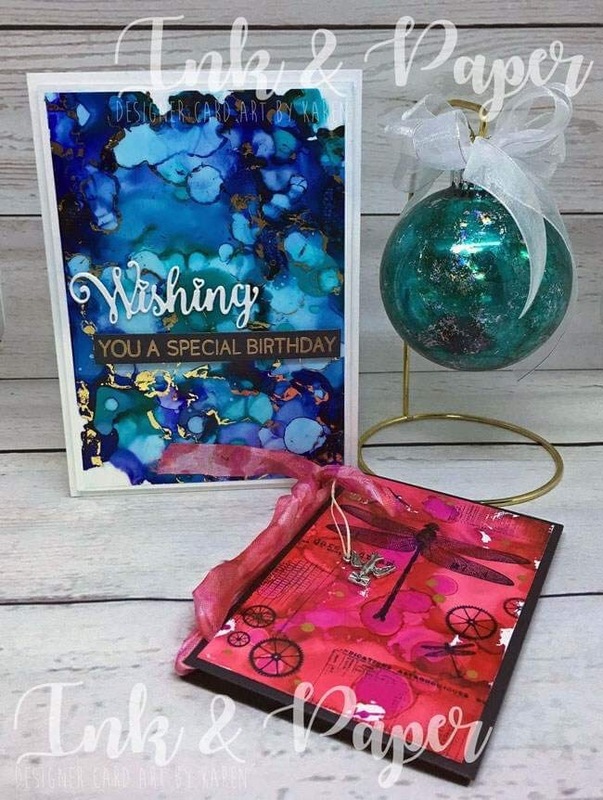 In this class you will make a birthday card using the alcohol inks and foil, a Christmas bauble once again using the alcohol inks and foil plus the mirror effect spray from Stamperia. You will also complete a small folder for a notepad, using the latest alcohol pearls, stamps from Prima and copic pen refills. You will also colour the ribbon using the inks. So if you want to play and learn how to use this amazing medium book early to avoid disappointment. Spaces will be limited and it is a class only event. Payment will be required by the end of April to ensure Karen has sufficient time to make the kits. Who can believe we are actually booking classes for May, it is craaaaazy. Demand is getting bigger for our classes so ensure you secure your place ASAP to avoid disappointment. Due to time limitations most classes will only be offered once, so check your diary and book in sooner than later. We do appreciate everyone paying upfront to secure your place, with guest tutors and class only events it is very important that we follow these guidelines.